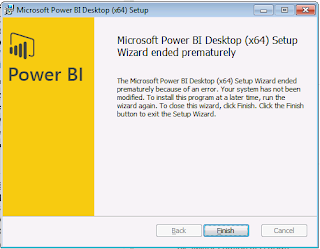 Wallpapering Fog: Is Microsoft's Power BI a Tableau killer? Is Microsoft's Power BI a Tableau killer? Have you heard of Betteridge's law of headlines? Then you already know the answer to this post's headline. No it's not. Why not? Good question. 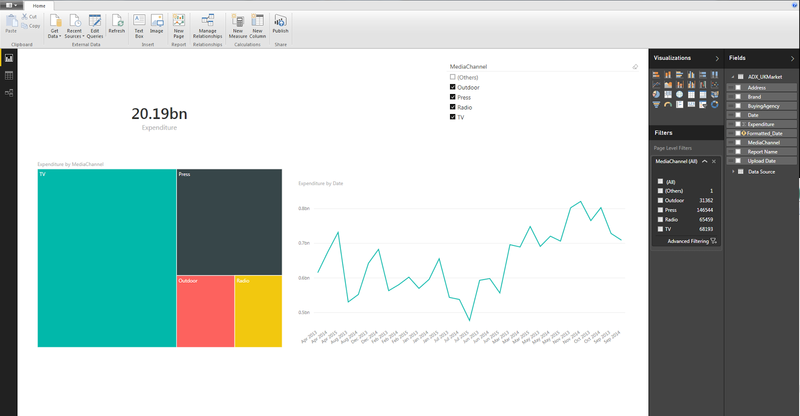 And there is one feature where Microsoft's Power BI manages to lay a glove on Tableau, but we'll save that for later. First, why are we here? My last post on Wallpapering Fog was part reminiscence, part rant and part lament about where it's all going wrong with Microsoft Excel. You see, I used to like Excel a lot and mostly, I really don't any more. It's still very useful, but in terms of new features, the bad stuff is starting to outweigh the good. I had a comment on that post from the design leader on Power BI - which is very flattering - asking if I'd tried the general availability version of their new software and I hadn't, yet. I have now. My IT department is also pushing Power BI so I really needed to take a proper look. A bit of background if you're unfamiliar with Wallpapering Fog - I've been using Tableau (full-fat and Public) for four years and love it, but wouldn't say I'm wedded to it. I'll be very comfortable jumping ship if something better comes along, but for now Tableau is the best BI software on the market by quite a distance. I think using the best and looking for better is a healthy attitude to take. Before Tableau, I used Excel Services. It was rubbish. Hopefully Power BI is better. Onto the test. 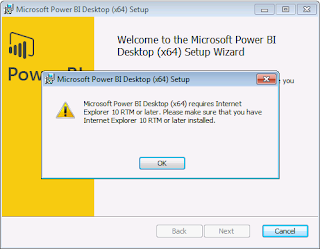 Is Power BI any good? I went to powerbi.microsoft.com and signed up. I got a button that said "Get Started" and clicked it. The website paused and said "working on it". Hmmm. I haven't asked you to do anything yet. What could you possibly be working on? As a (reluctant) SharePoint user, I know that "working on it" message all too well. This is not the most promising start. Still, it's gone in a couple of seconds and I've promised to be as objective as possible with this review. We're in, let's move on. I'm deliberately going to pile into Power BI without reading any instructions at all, because that's exactly the approach I took with two of its competitors - Qlik View and Tableau - and with both, I was able to make good things happen pretty quickly. I only needed help later, as more advanced features came into play. That's the benchmark. This will also be an early review and I haven't tested Power BI extensively. I may have missed things, but seeing what you can achieve with a piece of software in 24 hours is a useful exercise. In my experience, great software - like Photoshop or Tableau - will blow you away immediately and then keep on giving as you discover more depth. Before I'd invested any time in Tableau and long before I'd got involved with its community, you can read that it did that. What to do first? I need to connect to some data so we can put Power BI through its paces. Let's have a look at the options. I can load a csv file or spreadsheet, but decided to have a crack at an API connector and was presented with a slightly strange array of options. Acumatica (who?) and Circuit ID (also who?) but not the usual array of social, stock price and economic data connectors. Odd. Anyway, Google Analytics is there. Everything connects to Google Analytics. Let's try that. Oops. Five minutes of Power BI thinking about things and then I gave up and refreshed my browser. Maybe I'm being too ambitious (I'm not, I managed to do this in the competition's software). I loaded the example retail dataset. If I'm being picky, some of the formatting is a bit scrappy - especially considering it's the only bundled example - but it's a dashboard. Let's not be too picky yet. 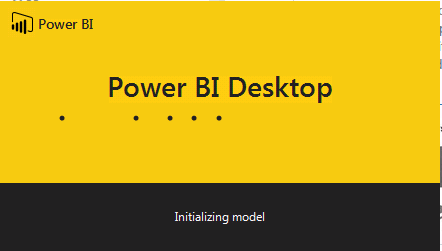 I can click around, highlight and filter and go into edit mode, but after a couple of minutes, I found a button for "Power BI for desktop" and downloaded it. I had hopes of more connectors for local databases and did find those. After I eventually installed it. Yeah, so like I said. Eventually installed. Including rebooting a work PC that doesn't hurry itself to reboot, that little lot took the best part of twenty minutes. Why don't I already have the latest version of IE? Because it's rubbish. I use Chrome and Firefox. On the plus side, from the desktop, the Google Analytics connector works. From this point on, the niggles stopped and Power BI was... Fine. Not good, not great. Fine. I loaded some traffic data from Google Analytics and drew a couple of charts. 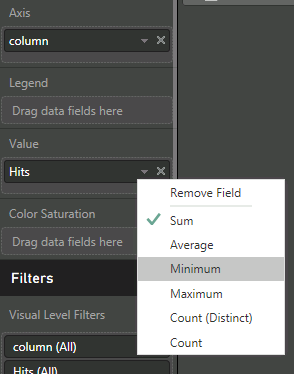 I noticed that dates don't automatically drill from years, through months, to days like they do in Tableau and so manually created a month field. Power BI's got a weird distinction between measures and columns, so creating that date column involved a brief false start. Apparently dates can only be a column, not a measure. What's the difference? Tableau switches effortlessly between dimensions and metrics, which is a very useful feature. You can split data by a numeric field (using it as a dimension), or you can add that numeric field up. At the point you create the field, the distinction doesn't matter - it's just a column of data and you choose what to do with it afterwards. Creating charts was straightforward enough, but quite limited. Microsoft have ditched the rows and columns interface from Pivot Tables (that Tableau adopted and supercharged) and gone with a vertical interface. It works, but it's nowhere near as intuitive. That list of options for summing, averaging and counting is again... fine. Just the basics. No frills. Enough Google Analytics. I restarted Power BI and connected to one of our advertising datasets on SQL Server. 350k rows that describe what different companies have been spending on advertising over the past few years, to see how Power BI would handle a little bit more data. It coped fine. Connecting was slightly counterintuitive because you have to tick a little box next to the table name, that's not obviously a tick box. Just clicking on the table name brings up a preview, but leaves the "Load" button greyed out and leaves you scratching your head for a bit. Data loaded, I quickly put together this summary view of UK advertising spend. You can filter across the whole page, or just on one chart. If you click on something - a date, or a category - then every element on the dashboard immediately filters to what you've selected. I like that sort of universal filtering behaviour, when I can control it, but it doesn't look like you can here. Everything filters when you click something, whether you like it or not. That has the potential to confuse the hell out of non-technical end users of your dashboard as they idly highlight a date and most of the data on the view suddenly vanishes. In keeping with the imposed filtering, you can drop a filter element onto the view (top right on my little dashboard) to make it more obvious what's going on, but you can't attach that filter to specific dashboard elements. You filter everything, or nothing. If you look closely at my dashboard, you'll see that the dates (which are slanted, yuk) are in the wrong order. That's because in our SQL Server, they're stored as strings. I tried to make a new column that would be a correctly formatted date and this happened. What's wrong with that? I don't know, it looks fine to me. Apparently Power BI doesn't know either, because the error message is blank. I tried calling it Formatted_Date, removing the space. Nope. I tried a few other ideas. Nope. Maybe DATEVALUE doesn't work like in Excel. That would be daft. Overall, Power BI feels like it's doing the bare minimum. You can drop charts, text and maps onto the screen. You can sum and average data. You can format axes and change colours. That's about it. There are features to create variables (when they work) and to connect data sources together, but BI software will stand or fall on the front end and how you are able to present data back to a user. Drawing on a couple of my own recent projects, this is Tableau. So's this. Both built in the free, Public version. As far as I can see, you've got no chance of producing visualisations like these in Power BI. It's not outright bad, it works, it's just miles behind the competition. Power BI hasn't come out swinging. It's a cagey, cautious entry into data visualisation that seems competent, but nothing more than that. Before we go on, I should mention price, because it's important. Full fat Tableau Desktop is over £1000 a copy. It bloody well ought to be good. 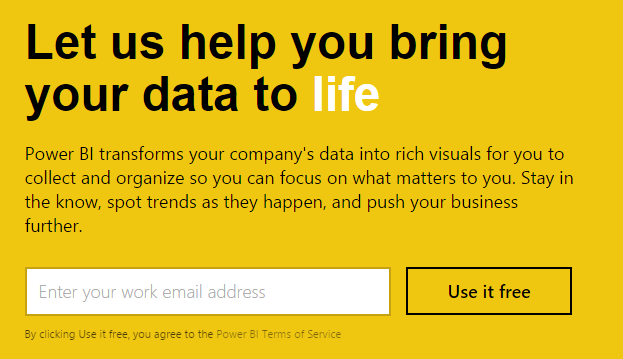 Full fat Power BI is $9.99 a month. These two pieces of software aren't targeting the same market. It's fairer to compare Power BI with Tableau's free offering - Tableau Public. Tableau Public is full-fat Tableau Desktop, with database connections stripped out and you can only save your visualisations to Tableau's cloud. We've established that in terms of the sophistication of visualisations you can build, this means Tableau will blow Power BI out of the water. 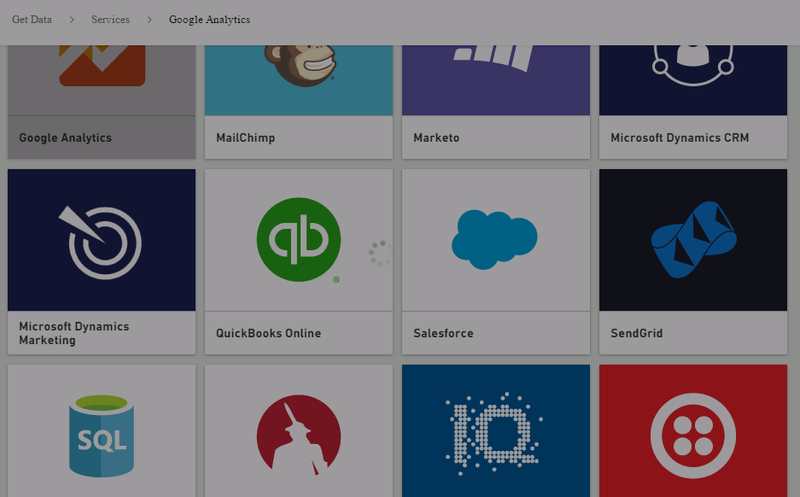 What about when you publish your dashboard to the cloud, for others to see? Data access and refresh is where Power BI wins over Tableau. It can connect to database sources and APIs and auto-refresh from those sources so that your online dashboard stays updated without you needing to do anything. This functionality is free and for $9.99 a month you can do those refreshes at high frequency, with a bigger data storage allowance, though one that only takes it up to the allowance that Tableau offers for free. OK Microsoft, you just got my attention. It might be just a line chart and a map, but an auto-refreshing line chart and a map is interesting. Well if I had an auto-refreshing dashboard, I'd want to embed it into this blog, or into hilltop-analytics.com, but you can't do that without paying $5 a month for SharePoint Online. I use SharePoint at work and it might just be the worst designed piece of software I've ever come across. I'm not even sure it was designed. No, I'm not paying my own money for it. For now, if you want to build a sophisticated, good looking visualisation, you need Tableau. If you want to build a more basic visualisation that refreshes itself, then Power BI is an option, but you'll only be able to share it on app.powerbi.com, not embed it. There are hopes within the Tableau community that Public will get Tableau's new web data connector, which is coming in the next mini-release. If that happens, then Power BI is dead in the water, because its auto-refreshing (at a low price) USP will be gone. In a business context, Power BI is in a potentially strong position. If your company has already bought into Microsoft's Office 365 and SharePoint stack - as mine has - then Power BI will integrate with that fairly cheaply and allow users to publish visualisations to each other. I wouldn't be at all surprised to see it gain a fair amount of traction. Unfortunately, as analysts, that will mean investing our time making the argument that Power BI's competitors, while significantly more expensive, are significantly better. Tableau and Qlik View are changes to how analysts work and massive boosts to their capability and efficiency. Power BI is not that. If you just want to automatically publish a table and chart of financial results to the exec team though, it will certainly be useful. Overall, Power BI is a 6/10 product and in places it doesn't feel finished. It's useable, but limited. Give it a try, but don't expect too much. I haven't mentioned Power BI's other innovation of natural language search. The idea is that users can type in "sales in France" (or similar) and the dashboard will show them that. I haven't mentioned it because it's a gimmick. Cortana (I assume it's got Cortana's engine) isn't the Starship Enterprise computer and it's not going to be intelligent enough to be useful. You'll see this message a lot. Unfortunately, I already have experience of this feature playing really well in a controlled demo, where the salesman knows it will work. It's going to make it harder to explain to an excited senior exec that Power BI isn't really very good, when "you can talk to it and it just understands!" In this review, I may have said Power BI can't do something, which it actually can. If that functionality comes from bolting on Power-something-else, then I'm not interested. Power BI, PowerView, PowerPivot... the Microsoft data ecosystem is a bit of a mess at the moment and it needs a more coherent offering. Power BI should work out of the box as a single download, as its competitors do and that is how I've tested it. How on earth do you build the kind of sophisticated vizzes shown in your links (solar system and paragliding) embedding pictures et al using Tableau? Do you have any links to any kind of a guide? 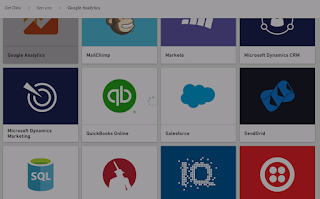 Very impressive btw and thanks for the write up on PowerBI, interestign to see an established heavyweight entering the field, can only push the likes of Tableau, Qlikview and Sibdo (have you used this as yet?) to evolve and improve. I did a how-to on the Solar System one, because it was an entry for Tableau's iron viz contest. Best way to learn stuff like this is to download other people's workbooks from Public and take them apart. Thanks for the comment! I haven't tried Sibdo by the way, but will take a look. Yes I realised you could download the workbook so have done just that :) Cheers, would be interested for any thoughts on Sibdo, an IT company I was working for recently wanted to implement it but I never actually got around to demo-ing it before I left. Kinda with you on the Tableau until something better comes along thing tbh! By far the most innovative feature of Power BI is it's ETL ability (Power Query). It is more than strange that you do not mention this. Tableau will never be able to clean data like this. Thanks for the awesome post. It's great to see someone review Power BI from a Tableau perspective. "BI software will stand or fall on the front end and how you are able to present data back to a user"
This is how I approached the review. All the ETL in the world is no use if the thing that you're loading your data into is average. Tableau has also got a reasonable amount of data reshaping capability (never say never!). If you do a back-to-back comparison, there's not actually that much in PowerQuery, which Tableau can't do. Tableau is definitely a nice piece of software, visualization ability is almost second to none. What I see on the MS side, I think they are trying to bring everthing into one single, more understandable "package", and their development speed is incredible for the last 6 months. May be it will be wise to compare them 1 year later. And also, their framework and targeted users dont look same a bit. We'll see how Powerbi evolve in time. But for now, Ms is offering, Poverpivot, POwerview, Powerview and PowerMap as a standalone addins for excel, sharepoint & excel services for publishing (rubbish look and efficiency), and now PowerBi site and Powerbi desktop !! What a mess! I am a big fun of tabular modelling, hope to see more vendors who are capable of consuming tabular models. double "powerview". Should be corrected as "MS is offering Powerpivot, Powerview, PowerQuery and PowerMap as standalone addins for excel..."
Power BI has a long long way to go. At present it's poor. But I sure Microsoft will work and improve this as they need to. Tableau is OK but I wasn't blown away by it. It's similar to Excel. If I had only a smallish amount of data I would still use Excel pivot and charts in reference to Tableau. Miles in front though is Qlik Sense. In a different league to anything else I have used. It still has the same script and expression capabilities of Qlik View (which is outstanding) but the ease of use to set up the sheets and visualization is in a different league compared to View. AND THE DESKTOP VERSION IS FEEE. And Apps can shared. Hi, this is a great insight into Power BI a year ago. 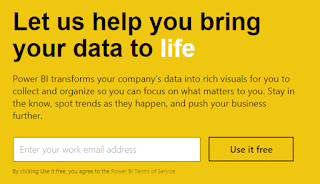 Have you re-visited Power BI recently? I'd be very keen to read your take on it in its current form. Good idea! I thought that might make for a nice blog post, so just downloaded and installed the latest version. It won't boot on my laptop (Windows 8, i7, 16GB). I get a loading screen, which says 'initialising model' and then nothing happens. I say nothing, the laptop got hot. It might be trying to do something, but no PowerBI. As one of the ppl leaving comment to that post, I'll revise my thoughts a bit. As I said in my previous comment one year ago, "It will be wise to compare them 1 year later". Now is the time! Power BI is now definitely number one tool to compare against Tableau, qlik or any BI tool. There are always some differences between apps, both positive and negative. Tableau is a great tool for its vizs and simplicity at the beginning. But when it comes to modelling more complex things, it fails. More than 5 fact tables in the same model, filtering some of them as many to many? That's my experience. However, once you learned the DAX, the modelling language of Power BI, and if u r not too far from star or snowflake schema rightfully, it 's outstanding. DAX is very simple language, but not easy. Once you learn the basic concepts of it, then it will flow. You can model many things, with a single line of expression. Viz power is just a lag behind of Tableau for now. But there is no big difference in capabilities in that area. Modelling power definitely beats what Tableaus has for now. ( once u learned the dax). Althoug there are lots of things to say about Power BI now (like Power Query), the gap one year ago between Power BI and Tableau is now mostly cosmetic.Tableau puts more strenght on visualizaion, but visualization is not enough when u dont have enough modelling capability. Tableau will not lose the race, but I feel it will be behind Power BI in the next 6 months. My 2 cents. Do not underestimate the progress that MS do with Power BI. I'm not kidding with this by the way. 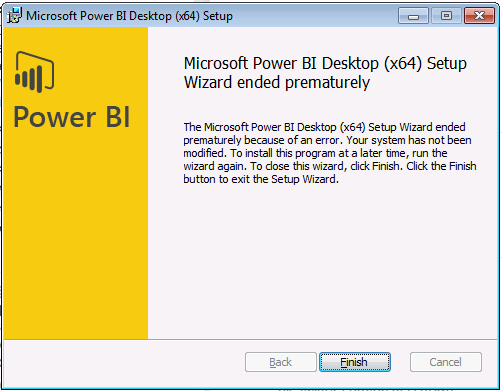 Installed latest PowerBI this evening. It doesn't start. Seriously, u should not stick to one app u know how to use. I started with Tableau, now I only use Power BI for serious corporate and self service modelling. Check the powerbi.com, start with "Guided Learning". It really isn't. PowerBI isn't open source software, where you accept some niggles because it's produced by a community of programmers. Microsoft is a large, commercial company. The software it produces needs to work out of the box. I commented a year ago that PowerBI felt unfinished and - at least in my case - it's gone from running but not very good, to not running at all. I don't use only one piece of software. Currently my suite includes Tableau, R (+ Shiny & exploratory), Python, SQL Server, Pentaho, Gephi and Excel. The door is always open to new tools provided they're useful additions. And that they run. We are developing custom connector using Tableau Web Data Connector API which provides us with an option to have customized UI for the accessing data using web services. Our system is fairly complex and a user has to make series of web service requests to get to the data. 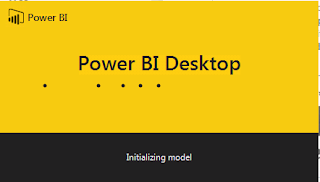 Is there any such functionality (API) available in Power BI, where we can provide a friendly UI without bothering our users to meander through complicated back and forth data connections to get to a specific set of data.